Last one for the week and normally we like a banging track for the weekend, but on this occasion, we’re going down the happy route with the latest track from Bonnie Bailey, which is out on Mark Doyle’s Fierce Angel label. Mark and Bonnie go way back, Mark originally signing her for Hed Kandi when it was his baby many years ago. 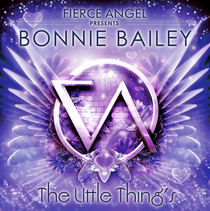 Since then, Bonnie has had a few good releases and millions of YouTube hits and now, she’s back with her first major single release in the form of ‘The Little Things’. With constant doom and gloom on the news, economies failing, recessions and power mad tyrants sealing their fate with barbaric treatment of their citizens, it’s nice to just kick back and listen to a feel-good record that gives you a few minutes tranquillity from everything around you. Although it's a commercial track, there should be a mix here to suit lots of jocks. Santiago & Bushido’s mix is the least commercial of them all, stripping the track back and giving it a dubbier feel. With a mix from The Bassmonkeys too, our favourites are the Fierce Collective Club mix and the Christian Ballard mix. Ballard supplies the original mix, as the producer on the track with Bonnie, whereas the Fierce Collective give the track that big room feel with a strong bassline and Bonnie’s full vocal. Sometimes it’s nice to just enjoy a good song. Make sure to check the cool video below.